One of Walpole’s few open shots all night. Needham’s Kyle Sullivan, who was praised for his rebounding, shows off his ball handling. 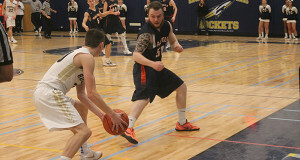 No team wants to lose on their home court, but the Needham Rockets boys basketball had plenty of added motivation not to drop a home game to the Walpole Rebels. 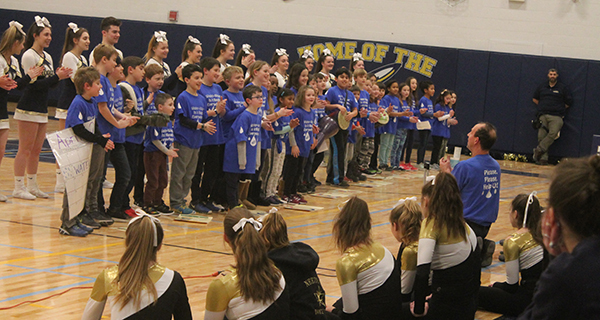 If Needham lost, it would have done so in front of their PA announcer, their dance team, their cheerleaders, and a group of fourth graders from the Hillside School, who were on hand to sing a song about water access and trying to raise money for Unicef. Luckily for them, they won 64-28, and with the win, Needham moved to 8-3 while Walpole dropped to 2-9. After the game, coach Paul Liner credited the win to defense and rebounding. 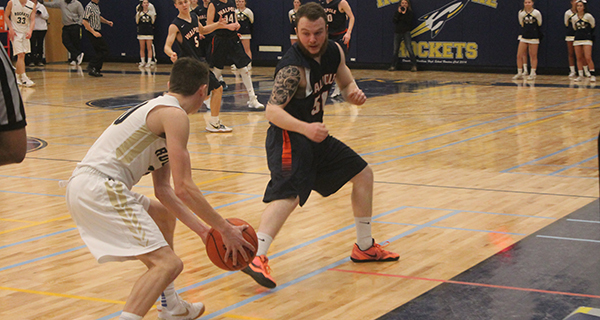 Defensively, they were a nightmare for Walpole, particularly in the third quarter. At the half, Needham was up 28-14. By the end of the third, they led 49-18. To Walpole’s credit, they never quit. Senior forward Cam Schlittler, in particular, played well in the fourth, but at that point the game was out of hand. Needham’s 1-3-1 gave the Rebels issues, with Walpole consistently trying but failing to get the ball to the corner, where there’s a gap in the zone. The Hillside kids perform their water-themed halftime show. Another issue for the Rebels was their size. For a while, Walpole’s small lineup struggled with Needham’s height. On a few occasions, Walpole found itself with Jake Gallant defending Needham’s Jacob Hamermesh. He hung tough, but at six foot five, Hamermesh was able to rise over the smaller Gallant. Liner credited the win to the whole team, noting that everybody played well. Needham had their whole varsity team, their dancers, their PA guy, their cheerleaders, and a whole bunch of elementary school kids contributing to their win. Walpole had an uphill climb from the opening tip.